Grab a Pig has been winning awards since it’s invention quite simply because children and adults love playing it. Who would have thought that from humble beginnings in 2003 Grab a Pig would still be as popular today as it was then. Card games come and card games go, but Grab a Pig is here to stay. Top Toys Ltd. carried on the good work after the closure of the Good Toy Guide. The company had the same ethics that kept the Good Toy Guide going for so long; i.e to recognise top toys and games for what they provide to the children. Children highly recommended Grab a Pig yet again. This has resulted in it appearing in the Independent newspaper; it was a firm favourite for toys to buy for the 2011 and 2012 Christmas season. Buy yours today from Amazon.co.uk or directly from us, the choice is yours. 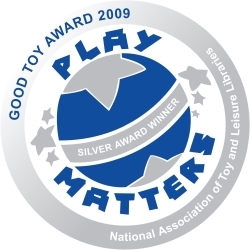 For 2009 it was not only Highly Recommended, but also won a Silver Award for the Young Games section. This was a proud moment indeed for us to receive this award from such a highly acclaimed magazine, one that has been running for 37 years. Over five years since it’s creation and Grab a Pig is still winning awards. The Good Toy Guide yet again highly recommended the Grab a Pig card game as the result of the feedback received from the children, parents and teachers who tested the games. For 2009 it was not only Highly Recommended, but also won a Silver Award for the Young Games section. This is a proud moment indeed for us to receive this award from such a highly acclaimed magazine, one that has been running for 37 years. Grab a Pig was “Highly Recommended” at the Good Toy Awards 2004. It was the only card game to receive this honour in the games section of the awards. “Grunting and oinking added to children’s enthusiasm and they liked the cheerful cartoon illustrations on the cards”. As if that isn’t enough Grab a Pig was also Highly recommended By The Good Toy Guide for 2005 too. One of the strengths of Grab a Pig is the rules; they are easy to understand and the the game is quick to set up. This simplicity makes it ideal to play anytime anywhere. Place the Pigs in the middle of the players, deal the cards and away you go. If you like to laugh and you like card games, you’ll love Grab a Pig.